This year through the ICES International Student Exchange program, Estacada High School has foreign exchange students from a variety of countries, including Norway, France and South Korea. When Jung Su Park first arrived at Estacada High School, he thought it would be like "High School Musical," the Disney movie filled with singing, dancing and endless amounts of school spirit. "I thought there would be more energy," said the 16-year-old student from South Korea, noting that he's enjoying his time here even if it didn't meet this initial expectation. 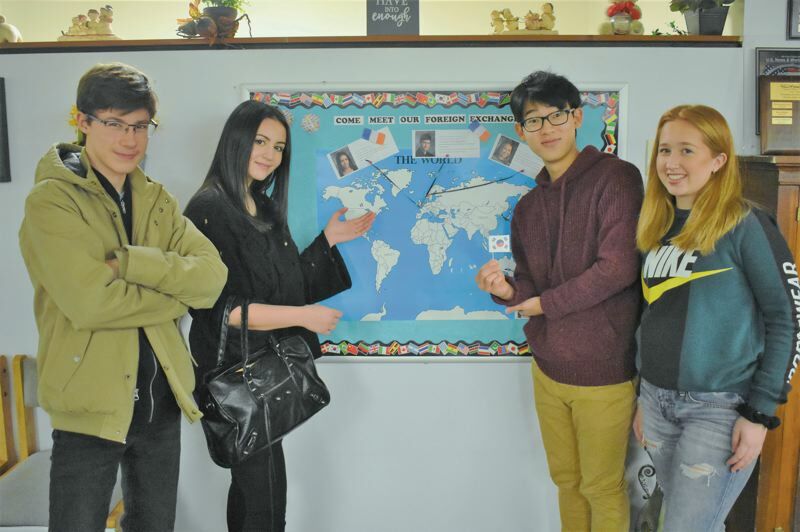 This year through the ICES International Student Exchange program, Estacada High School has foreign exchange students from a variety of countries, including Norway, France and South Korea. Students stay with local host families and attend classes and participate in extracurricular activities at the high school and around town. Some have been looking forward to their time in the U.S. for many years. "It was my dream to do one year as an exchange student," said Angel Dorinet, an 18-year-old student from France. "At 6, I said to my parents, 'I want to live in the U.S.'"
Kat Hoeye, a 17-year-old student from Norway, found the inspiration to go abroad through family. "My sister inspired me (when she studied abroad). You find a new family and live with them and get to know American culture, make new friends and see school spirit," she said. Emery Ago, a 14-year-old student from France was drawn because of the opportunities to study science. He plans to be an astronomer. Students have enjoyed being immersed in American culture. "People are very friendly here, very helpful and there's good vibes every time," said Dorinet. "I like that. It's very important when you have a project or want to work. It's important to have next to you a good person." Hoeye has appreciated this as well. "It's really easy to make friends. People are really open," she said. "I'm happy. I was scared on the first day I wouldn't make friends." Ago added that he enjoys "everything about high school and the life of my host family." There are several differences between Estacada High School and schools in the students' home countries, including additional freedom when it comes to selecting courses. "There are a lot of fun classes," said Ago. "Choir, drama, cooking." "I was surprised we could choose the subjects," Park added. Dorinet appreciates being able to select more of her own classes. "You want to do better when you chose the class. The American students are lucky to have this system," she said. Students are staying busy outside of the classroom, as well. Park has been involved with choir, track, soccer and the fall musical "Newsies," which he described as "kind of" like High School Musical. "It was so cool. It's one of the best memories," he said. "Everyone helped out, learned together and made more friends." Hoeye hopes to join the softball team in the spring and enjoys showing school spirit at athletic events. She's also appreciated spending time with her host family's horses. "Before, I had never been with horses," she said. "The barn is my favorite place in Estacada. In Norway I live in the city. I'm not used to farm life. I'm happy I didn't come to the city again." Dorinet is a member of the Estacada High School RIOT Dance and Cheer team. "I love dance," she said, noting that she's done it for 12 years in France. This year's foreign exchange students noted several other differences between the U.S. and their home countries. "The people here are calm. In Korea, everyone is hurried," Park said. Dorinet noted that "the food is very different here." "Dinner is not always with family, sometimes you take a snack in your room," she added. "You don't always eat around the table," Hoeye added. The group sees many benefits to spending time abroad. "Everything is possible. I understand that now," Dorinet said.